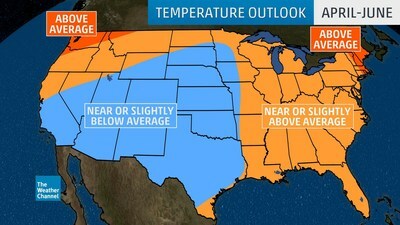 Heading into June and the summer season, El Niño will linger into a second year, bringing cooler-than-normal temperatures across the Northern and Central Plains, along with parts of Nevada and California. The most significant warmth is expected in the Northwest, with both coasts seeing above-normal summer heat. El Niño is characterized by a band of warm ocean water in the central and eastern tropical Pacific Ocean, accompanied by high air pressure in the western Pacific and low air pressure in the eastern Pacific. Back-to-back El Niño events are fairly uncommon, only happening five times since 1950. In four of those five years, the Northern Plains and Great Lakes experienced below-normal summer temperatures, with warmer-than-normal temperatures across the southern tier and Pacific Northwest. "Emerging El Niño conditions over the last year resulted in a historically wet period across much of the United States," added Crawford. "The anomalously high soil moisture, combined with lingering El Niño conditions, will likely limit the magnitude of the summer heat this year, relative to the very hot summer of 2018." Later this year, IBM and The Weather Company will release its new Global High Resolution Atmospheric Forecasting System (GRAF), the first hourly-updating commercial weather model that offers nearly 200 percent improvement in forecasting resolution in locations around the globe. Today, most of the world has to settle for less accurate forecasts for predictions that cover 12- to 15-kilometer swaths of land–too wide to capture many weather phenomena. And, traditionally, leading weather models update less frequently, only every 6 to 12 hours. In contrast, GRAF will provide 3-kilometer resolution that updates hourly, democratizing weather forecasts globally and delivering reliable predictions for the day ahead.